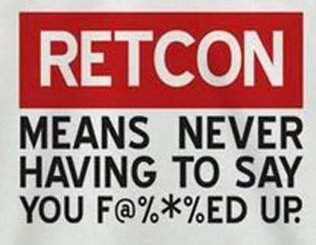 Retcon is a comic book term, short for retroactive continuity. It grew out of the fact that the stories of certain iconic comic characters were told over an incredibly protracted period of time, 60 or 70 years in some cases, without the characters getting appreciably older in the process. In much the same way that classical mythology was re-appropriated and revised from one society to the next, each successive generation of comic creators has made subtle (or sometimes not-so-subtle) alterations to key elements of a character’s backstory, to keep the character relevant to contemporary society. And not only do the story points themselves change, but as so much time has passed, the time periods change as well. If you don’t have the luxury of a character who was trapped in suspended animation since World War II, moving a character’s origin forward in time is often the only way to explain how a character from that age now inhabits modern times. And believe it or not, in the relatively short period of time that “Fury of Solace” has been on the world stage, we’ve had to resort to both varieties of retcon. Due to the realities of our indie production, we’ve been forced to revise the timeline of our story several times already. This is, of course, a direct result of the cross-platform, transmedia story that we’re trying to tell. If this was just a traditional narrative, with only live-action content, we could (though it would be far from ideal) have a hiatus of several years between one installment and the next without any significant alteration being necessary, the audience would just assume that the much-delayed new content occurred right on the heels of the old. There are a number of elements of our story, however, that make these production exigencies problematic. For one thing, our characters live and breathe in what purports to be real time on social media sites like Twitter. With a blog, you can change the date after the fact (and believe me, that we have done), but so far, at least, a Tweet is indelibly timestampped for now and forever, a snapshot of a particular moment in time. So here was our dilemma: in telling this story, we realized two things. One, unlike most web series, “Fury of Solace” is very serialized. It’s not the kind of thing you can release every so often and expect people to be able to follow the narrative flow. So after telling the beginning of our story in fits and starts, we decided that the best approach was to produce a significant chunk of material all at once, and to release it as back-to-back as possible. But with the reality that all of the cast and crew were fitting in production amidst full-time, gainful employment, time marched ever forward without the story progressing in kind. And the thing is, I wanted to have our cake and eat it too. Through social media, I wanted to give the illusion that these characters not only do exist, but have existed for some time. In some ways, that is the only silver lining to our production being as drawn out as it was (that, and the fact that we had the foresight to create Twitter accounts for characters well in advance of them actually being introduced in the narrative). But at the same time, when our last new material was released in 2010, it simply did not make sense story-wise that the 2 years of real-time that passed in the interim between then and our 2012 release would have passed in the story-world of “Fury of Solace” as well, given that the story had not progressed at all during that time. This is exactly why we wound up retroactively claiming that the material we shot at San Diego Comic-Con 2010 featuring the character of Uroboros was taking place concurrently with the material we shot at Comic-Con 2009 featuring Fury of Solace. And why we subsequently retconned both events again, to pretend they occurred at Comic-Con 2011. For new viewers, hopefully the transition is relatively seamless. From their perspective, the only real evidence of our time jumps will be if they scroll back through the characters’ Twitter timelines and realize that the dates don’t match up. But ultimately, I think having an archived, social-media history between these characters is worth dealing with those kind of discrepancies. When you put something on celluloid, or our modern-day digital equivalent, I still feel like that ought be considered verboten. I certainly bemoaned George Lucas’ “Star Wars” special editions as much as the next fanboy. So maybe I’m being hypocritical when I say this, but this format we’re using for “Fury of Solace” not only encourages retroactive continuity, it actually almost requires it. Especially since we’re trying to develop characters that exist with some autonomy outside of the story. It eventually dawned on me that since we have character blogsites that exist autonomously from the website for the show, those blogs have to be complete in and of themselves. There has to be a blog entry, for instance, that says “This is my first blog.” And since we’ve backdated some blog entries to make it seem like they started before the series did, this requires us to have a pretty good handle on what blog-worthy events would have occurred in that pre-show time period. And I know my co-executive producer Matt Hartman is rightfully wary of us locking ourselves in to certain plot points by introducing these backdated blogs into canon, and while that definitely can be a slippery slope, I walk a fine line as far as the blogs are concerned. The way I’m currently approaching it is, as our story continues to unfold, if a detail here or there about a certain backstory needs to change to suit the overall story, I would not hesitate in the slightest to revise a written blog after the fact. I guess what I’m saying is, if you hear a character says something in live-action, it’s canon. If you read it in a blog, maybe that “fact” is a little more fluid. Over the course of the show, I’ve also retroactively gone in and added blogs that weren’t there before, chronologically in between blogs that had already been published. Is this potentially-confusing and perhaps unfair to longtime viewers who were there when those surrounding posts were originally published? Perhaps. Unfortunately, until we have a little bit of money in our coffers and can shoot this stuff roughly in real time, I don’t see as we can avoid it. I regret having to make these changes for the sake of the viewers who have been with us since the beginning, but hopefully, in the end, the changes won’t leave too many people scratching their heads. And I promise, we’ll try to hit the retcon button as infrequently as is humanly possible!